As a graphics company first and foremost Nvidia has made it a goal to be at the forefront of pushing visual computing technology in every avenue where it’s deemed feasible. The GameWorks program is a prime example of the company’s extensive hands-on approach to push graphics technology to its limits in arguably the purest, most engaging and most challenging media of all, video games. 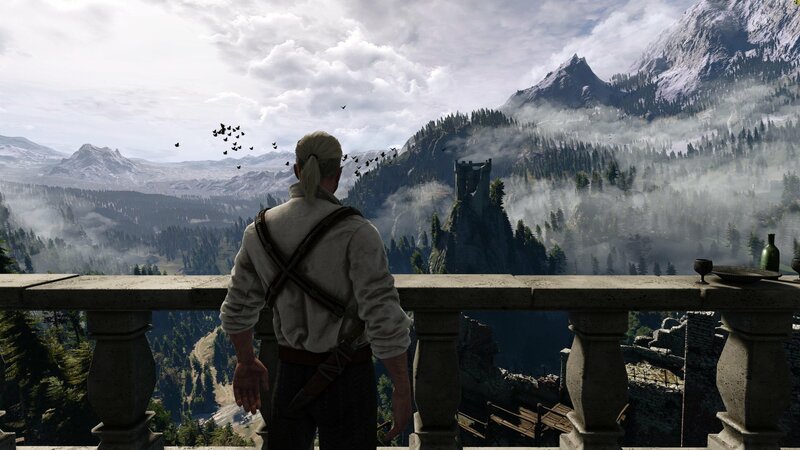 Games have been long regarded as works of art. They’re creations sculpted in the eyes of their creators to make their dreams a living breathing reality. Game worlds are truly that, worlds. They’re complex and intricate constructions that exist not only to serve the purpose of achieving the desired gameplay design but more importantly to tell a story. And what better way to tell a story than to visualize it. The process by which an idea evolves to something that you can interact with using your most stimulating sense of all, sight. And it’s this process of creation, of transforming a concept into something tangible that we can interact with using our senses is what truly defines creativity. The more ambitious the project the more challenging it becomes for creators to make their ideas a reality as they’ve envisioned them. This is where a program like GameWorks can help bright minds in the game development world make their games look the way they’ve always thought they should look and put them on our screens. Today you’re in for a treat. I’ve been engaged with the folks over at Nvidia, who have kindly humored me for several weeks in my attempt to tell the GameWorks story in all of this. How it started, what it’s doing and where it’s going. So buckle up, because this is going to be a fun ride. Let’s begin by explaining what GameWorks actually is and why it exists. 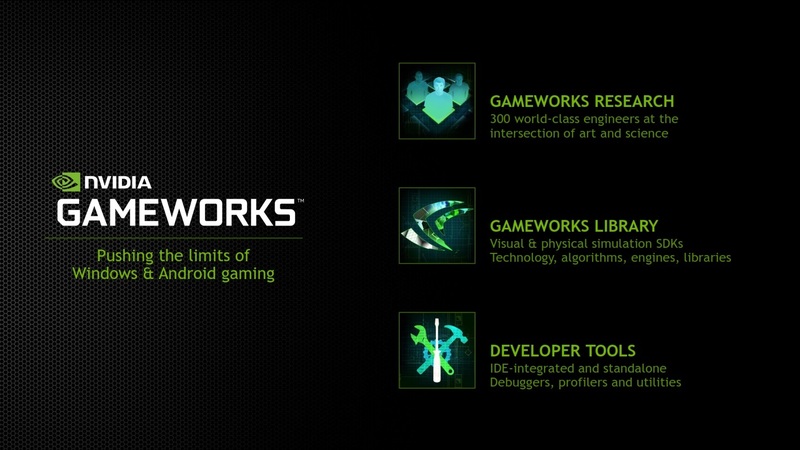 GameWorks is a developer program that was established by Nvidia in late 2013. Its goal is to provide developers with a collection of tools and graphics libraries for a variety of ends. Be it to help them improve the visual quality of their games, develop software for Virtual Reality solutions or even mobile platforms powered by Nvidia hardware. A great number of technologies fall under GameWorks and they include software development kits, game physics engines and a library called VisualFX. This library encompasses a number of Nvidia optimized rendering techniques and in-game visual effects that span everything from shadows to anti-aliasing, depth of field, global illumination, hair and fire simulation, ambient occlusion, lighting, and other effects. Below you will find the Physics and VisualFX solutions as listed on Nvidia’s website. We wanted to learn how the program has been received since its inception and the rate of adoption thatit has seen. As such, Nvidia’s Brian Burke has kindly agreed to share some stats exclusively with us. We’re told there are over 150 thousand members enrolled in the program as you read this, which is quite remarkable and it has seen constant growth month on month. Members of the program are very global and have wildly diverse needs. The most popular downloads we’re told are Nsight, Androidworks, PhysX, Flex and HairWorks. However, to really tell the story of how all of this came to be and where it’s going there’s really no better person to talk to than Rev Lebaredian, Mr GameWorks himself. Rev’s official position within Nvidia is Sr. Director, GameWorks and he has headed the program since its inception. Rev kindly agreed to chat on the phone a few weeks back and talk about how the program started, the challenges the team faced, where he hopes to take the program in the DirectX 12 era and what has been his proudest achievements. Please walk our readers through how GameWorks grew from an idea to a vision and ultimately to this large initiative with over 300 engineers, highlighting any important evolutionary milestones along the way since the program’s inception two years ago. “GameWorks as a name was introduced two years ago, but the team and the dedication to pushing the envelope have been in place for many years. For over a decade, we’ve been working closely with game developers to enhance and optimize their games, maximizing the full potential of our GPUs. Rev explained that for long developers have had no incentive to use all of the new features that the latest hardawre has been bringing to the table. That’s because all the work and effort spent on these new technologies would only benefit a very small minority of the market that has adopted this new hardware. This meant that visuals were always several years behind and that’s why initiatives like GameWorks are very important to keep pushing the envelope. How have you managed to cater to the broad spectrum of developers that range from the really experienced and adventurous who like to know every little detail about the tech and tweak it and others who just want things to work and don’t necessarily share the same level of interest in the nitty and gritty of things? Rev went on to say that it’s really important to have a mechanism by which developers are able to do just that but in a away that doesn’t let code branch. So whatever improvements are made can then be passed on to all other developers. This also ensures that updates can be made on a continual basis without issue. Rev noted that this is a challenging area where it’s been a constant learning process for the team to work on and refine this mechanism. DirectX 12 is coming next year bringing with it a few new features such as conservative raster and tiled resources. Have you run into any challenges or problems that you believe DirectX 12 or the new features can help you overcome in terms of realizing a visual effect or a performance target that was quite challenging under DX11? “We support all APIs that game developers care about. Currently, DX11 is still the most widely used API, so we continue to support it and provide efficient solutions within this API. That being said, as DX12 gains more adoption, we will release DX12 compatible versions of GameWorks modules, as we see demand for them. What areas of the program or achievements are you proud of the most and which areas do you believe deserve more attention, development and general improvement? And can you give us some examples of game developers’ involvement in this process of improvement? Be it through feedback or other means. “Personally, I’m most proud of the adoption of our technology in top titles in the past few years. Most recently, we worked with Bethesda on the Volumetric Lighting feature in Fallout 4; the hair and fur in Witcher 3 was a big hit as well. If it wasn’t for our hard work and cooperation with these game developers, some of the effects we can enjoy now would probably not be in any games for years to come. We are continually looking to improve all of technologies through direct feedback from game developers, and from feedback from our own team of engineers and technical artists who work directly on title engagements. As our libraries, tools, and engine integrations mature, we’re seeing quicker adoption of our technology. Let’s take a look at our PhysX SDK as an example. Since the first version shipped in 2005, thousands of developers have used PhysX in hundreds of games and demos, in several game engines, as well as for applications like education and industrial simulation. The PhysX ecosystem spans desktop, mobile, console and cloud platforms. Over the years we have received tons of feedback from our developer partners, particularly Epic, Unity, Natural Motion and Autodesk, among many others. Whenever practical, we collaborate directly with developers to implement new features, and we have often adopted changes suggested by customers. We co-developed our first PS3 ports with Sony. In 2015 we opened up source access through GitHUB. Bringing this to a close it’s important to look back at 2015 and realize how significant it’s been for GameWorks. Last year has seen the highest level of adoption of Nvidia GameWorks technologies to date by our account. Not only have we seen more more major titles come out with GameWorks features than ever, but we’ve also seen some GW technologies make it into games for the very first time such as WaveWorks in Just Cause 3 and War Thunder. We’re already two weeks into 2016 and while the Nvidia folks told us that they weren’t ready to announce anything new just yet, they did hint at some exciting things to come this year for GameWorks and DirectX 12. Which makes a year that’s already shaping up to be one of the most exciting for gamers and enthusiasts even better.